A student company that will give customers a chance to donate to charity in ordinary business transactions took home over $10,000 in prize money last night, after winning a University competition that challenged students to create a viable and socially conscious business plan that incorporated technology. 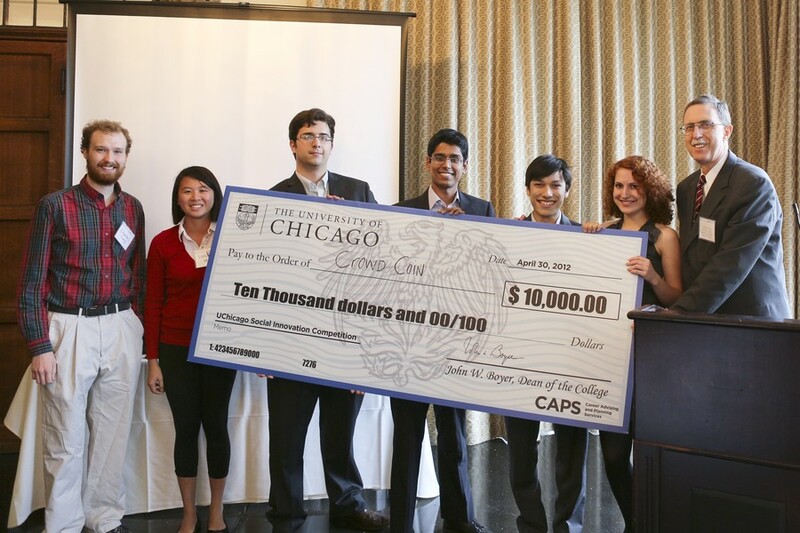 CrowdCoin, which was selected from five finalists in the UChicago Social Innovation Competition, plans to install buttons at cash registers that will allow patrons making a purchase to automatically donate to charity. Once they press the button, their bill will round up to the nearest quarter with one click and nearest dollar with two, donating the difference to charity. Fourth-year C.J. Martino, who studied financial modeling for CrowdCoin, said that the company would begin to implement the button in local businesses in Hyde Park and have them fully operational by the end of the summer. “We project that we could raise millions of dollars for charity by 2015,” Martino said, adding that data from Hyde Park businesses would be used to show national brands the feasibility of the button. CrowdCoin has also tested the button at charity bake sales and at student-run cafés. Second-year Matthew Krisiloff said that the idea for the company came out of a desire to eliminate spare change. To study the distribution of change in businesses, Martino said that CrowdCoin had studied a statistical model using data from Starbucks. In addition to Martino and Krisiloff, CrowdCoin is also composed of second-year Achith Murali and third-years Chelsey Rice-Davis, Charles Cary, and Linxi Chang. The four other finalists, selected from a total of 25 teams, each received $1,000 and will work with alumni to develop their ideas. These projects included developing eco-friendly housing abroad, connecting Chinese students with resources to help them learn English so they can study in the U.S., providing a reliable feedback service to measure effectiveness of NGOs, and creating community restaurant partnerships to provide fresh food. The purpose of the competition was to encourage students to create either a for-profit or non-profit venture. Dillan Siegler, director of Chicago Careers in Public and Social Service and one of the three CAPS organizers of the competition, explained that she was looking for diversity of ideas by involving students from multiple majors and backgrounds to work together in teams. “We wanted to see what ideas the best minds could come up with that have positive social impact,” she said. Addressing all of the finalists before the results were announced, Dean of the College John Boyer said that the competition embodied the values of the University.